This began as a tone study in blue. I used several different blue tones. I gradually mixed in black to get the darker tones. However I used Peach Black (Holbein) and, looking at the study from a distance, the matt finish appeared as a black stain. I tried mixing in more blue but ultimately I scraped off some of the pigment, and some of the paper in the process. I painted over this damaged area with yellow gouache. The bits of orange and red surrounding the blue, blue/black brush strokes added contrast to this composition. 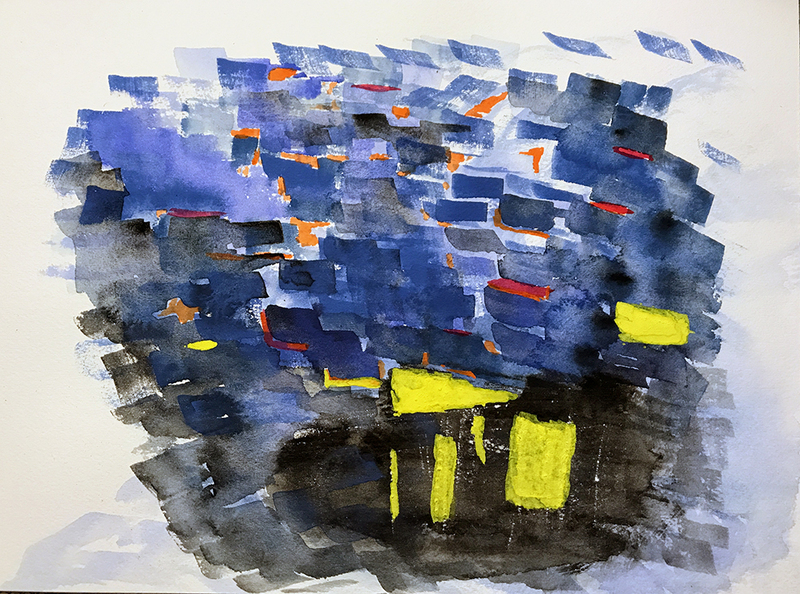 This entry was posted in Personal Stories and tagged abstract art, artistic process, creative process, creativity, gouache, painting, peach black, tonal study, visual arts, watercolor. Bookmark the permalink. This is really beautiful 🙂 ❤ Were the colours inspired by the fire hydrant photo you took? Wonderful. Thanks again, Miranda. No, the painting and hydrants were executed on different days. My unconscious may have be aware of, and may have contributed to a connection, but I think they were separately inspired. Thank you, Miranda. I’m honored! Very kind of you to say.